Monocled cobra bites are very dangerous and a bite can be potentially deadly. These cobras have caused many deaths in Thailand over the years, despite good antivenin. The venom affects nerves and blocks their ability to send nerve impulses, which can result in death when the diaphragm cannot function. and efficient hollow fangs in the front of the mouth. LENGTH: Up to 2 meters (6 feet 7 inches). GIRTH: Up to forearm thickness (28 cm or 11 inches circumference). RANGE: Found all over Thailand. and after dark on the ground. FREQUENCY FOUND: Found often as they tend to be in residential areas where they eat rodents, toads, frogs, fish, and snakes. 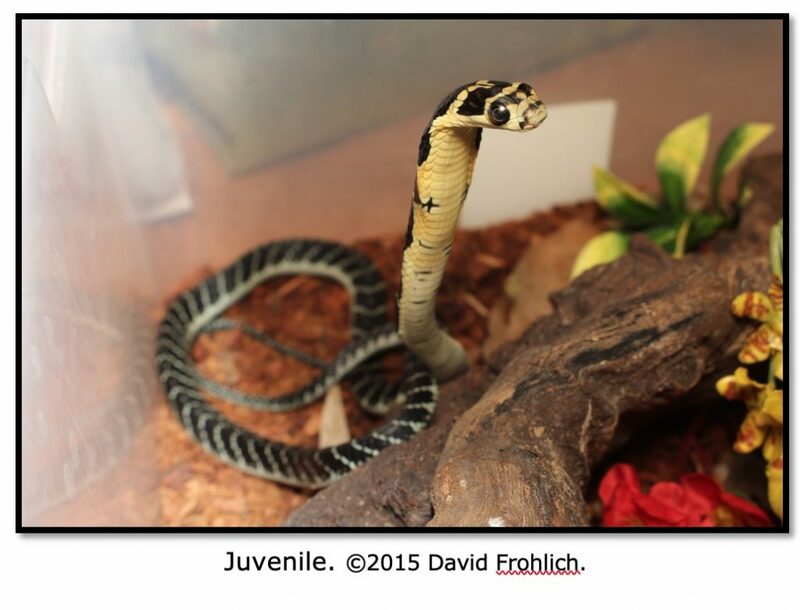 THREAT DISPLAY: Cobras typically flatten their necks and raise their heads off the ground as shown in the images above. It is a myth that they cannot bite without having hooded first. They strike by thrusting the head forward and down, or nearly horizontal. with or without provocation. It will bite when cornered or in close proximity. shown first. If you step on this snake, it is very likely to bite. aggravated as temperatures get warmer than 33° C (91° F). 1.) May form a hood with the neck (flattened). 2.) Can hiss by forcing air out of the small space in the mouth. 3.) An eye or monocle shape is usually present on the back of the hood. 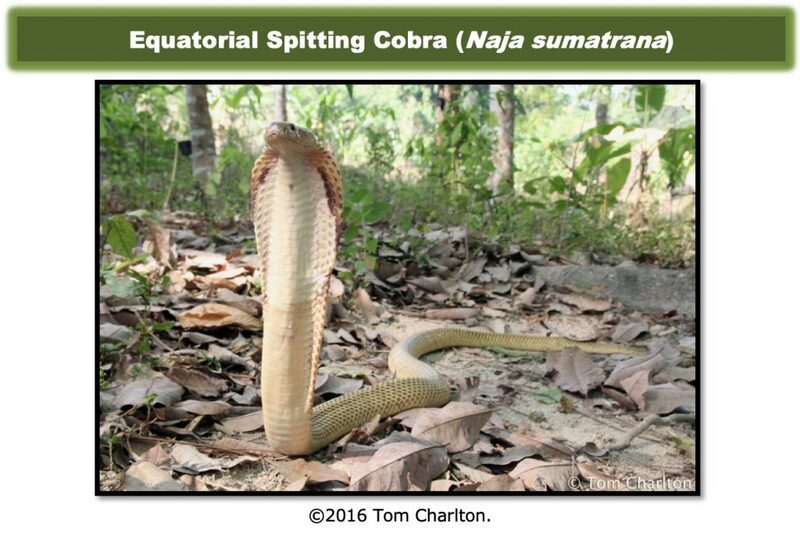 SIMILAR VENOMOUS SPECIES: The next two snakes – Thai Spitting Cobra (N. siamensis) and the Equatorial Spitting Cobra (N. sumatrana) can look very similar. (nerve damaging) and necrotoxic venom causing skin and muscle destruction primarily. diarrhea, dizziness, unconsciousness, or convulsions. Most large public and private hospitals in Thailand will have this antivenom on-hand, or can obtain it quickly. If venom from this snake has contacted your eye(s) follow directions here. 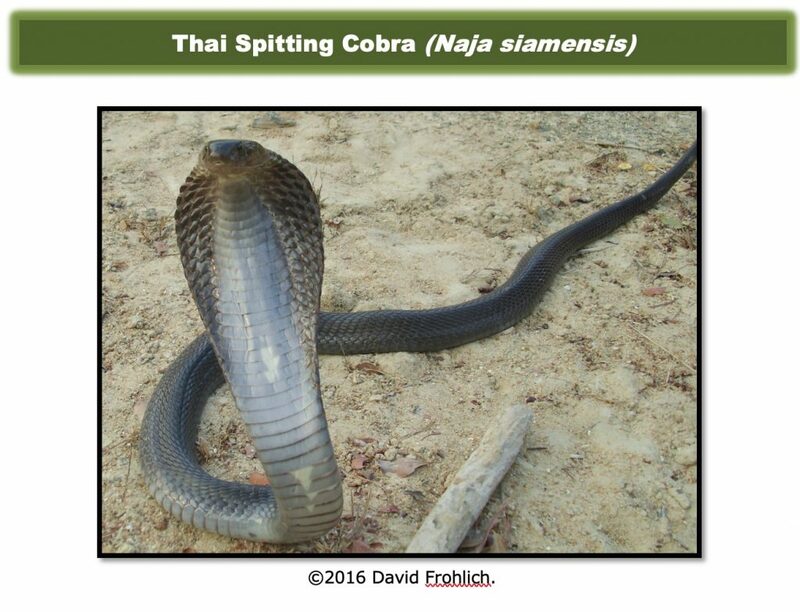 Thai spitting cobras are very dangerous and a bite is potentially deadly. These cobras have caused numerous deaths in Thailand over the years. This snake is active at night and preys on rodents. Like the other two cobras in the Naja genus, this snake tends to become very easily aggravated as temperature rises above 33° C (91° F). human eyes from two to three meters away. LENGTH: Up to 1.6 meters (5 feet 3 inches). RANGE: Across Thailand north, west, and east of Bangkok. ACTIVE PERIOD: Primarily nocturnal and active on the ground. to have clean water with you while walking through Thailand’s rainforest. same behavior can be expected. 1.) This snake may have a monocle, U, V, or H shape on the back of the neck (hood). 2.) If the snake hoods and spits, it is likely one of the two spitting cobras. SIMILAR VENOMOUS SPECIES: Monocled Cobra (N. kaouthia) and the Equatorial Spitting Cobra (N. sumatrana) can look very similar. in treating bites from Naja siamensis. Most large public and private hospitals in Thailand will have this antivenin on-hand, or can obtain it quickly. Equatorial spitting cobras are very dangerous and a bite is potentially deadly. These cobras have caused deaths in Thailand. This snake, like the other two cobras in the Naja genus tend to become very easily aggravated as temperature goes above 33° C (91° F). Their venom is necrotic – destroying tissue, and neurotoxic – affecting the ability of the muscles to send nerve impulses. DANGER: 5/5 – Extremely dangerous. VENOM DELIVERY SYSTEM: Very good. excellent, and they can hit your eyes from two to three meters away. ACTIVE PERIOD: Mostly active at night on the ground. 1.) Occurs in yellow or black phases. 2.) No mark on the back of the neck (hood). 3.) Black form may have yellow bands, spots, or eye shaped marks. SIMILAR VENOMOUS SPECIES: Monocled Cobra (N. kaouthia) and the Siamese Spitting Cobra (N. siamensis) can look very similar. ANTIVENIN: No specific antivenom in Thailand exists for this snake. Hospital staff will treat symptoms. king does not need to show a hood before it can bite. in the front of the mouth, and a very large volume of venom. LENGTH: Up to 5.85 meters (19 feet 3 inches). GIRTH: Up to human thigh thickness (51 cm or 20 inches circumference). THREAT DISPLAY: King cobras also flatten at the neck and raise their head off the ground in a defensive stance when alarmed. Large kings can raise up more than a meter high. The higher they raise their heads, the more reach they will have as they strike, falling straight forward the same as the other cobras do while striking. get very close before they become alarmed. 1.) Length can be one identifying feature. 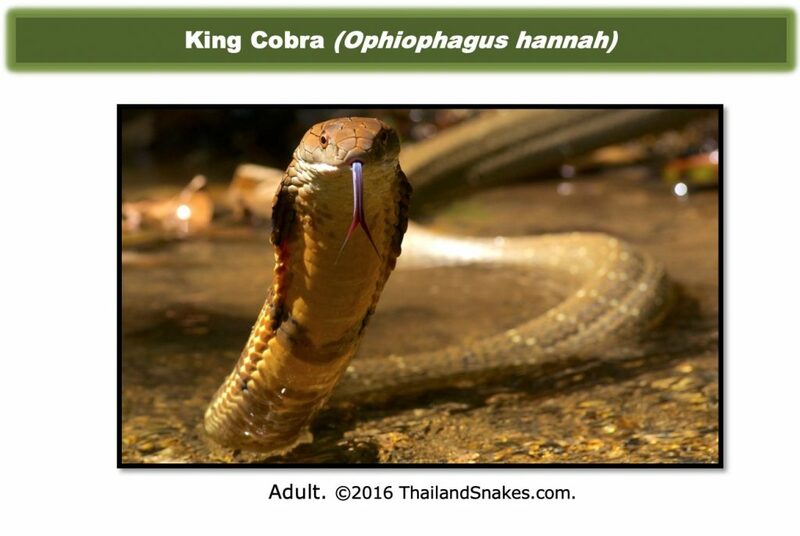 If the snake is a cobra (hooded) and 3 meters or larger, it is definitely a king cobra. 2.) Variable color – solid black, olive green, or brown, black or brown or yellow or tan or olive green with thin light colored bands. 3.) Juveniles are dark with light chevrons across the entire body and top of head. 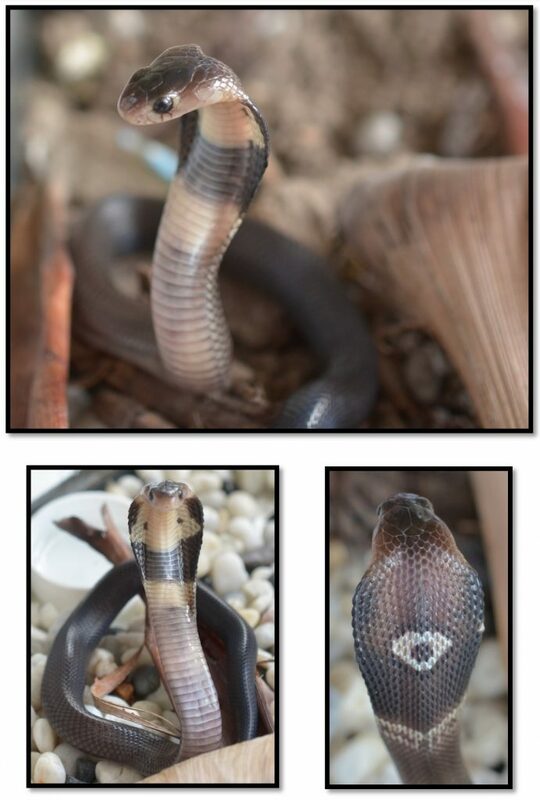 ANTIVENIN: King Cobra Antivenin from Queen Saovabha Memorial Institute, Bangkok, Thailand. Phone: +66 2 252 0161 (0162, 0163, 0164). Most large public and private hospitals in Thailand will have this antivenom on-hand, or can obtain it quickly. Wrap bites from this snake immediately. Click here for more complete instructions.